Now Ole Gunnar Solskjaer has deservedly been given the Manchester United job full-time, attention will quickly turn to the targets he wants to sign. United have never truly replaced Rio Ferdinand and Nemanja Vidic and a centre half will be a priority. A full-back is likely to be high on the shopping list, too. But the most important bit of business Solskjaer can do this summer is to keep hold of Paul Pogba. 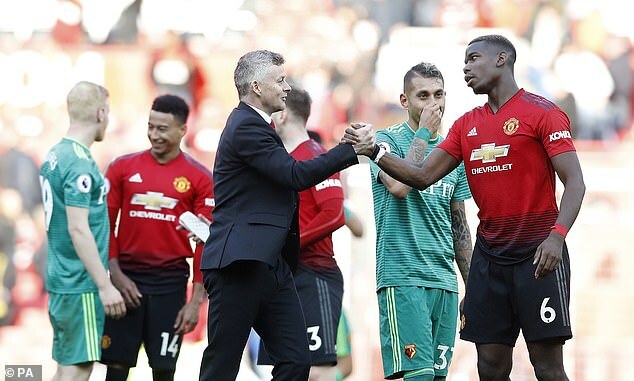 A couple of months ago, when Pogba was inspiring United’s astonishing revival under Solskjaer, the midfielder’s future did not seem in doubt. The return of Zinedine Zidane to Real Madrid has changed that. Zidane does not hide his admiration for his fellow Frenchman, saying on Saturday: ‘I know him personally. He brings so much and there are few players who bring as much as he does.’ Pogba himself has said that he would be open to a move to the Bernabeu once his time in Manchester has ended. He may well feel that this summer is the right time to leave. Failure to qualify for the Champions League may not prevent United from attracting the best players but it could convince Pogba to go. Despite a dreadful season by their standards, Madrid look assured of a place at Europe’s top table next season. But I would not be surprised if he wanted to leave for other reasons. I cannot think of another player in the Premier League who has divided opinion as much as Pogba. If he plays badly, he gets slaughtered. If he plays well, then he is simply meeting expectations. The spotlight would be on him even more in Spain but he may feel he has never been fairly treated in England. Should Madrid offer the £89million United paid for Pogba, the club may well be tempted to cash in but that would be a mistake.